Comedy club that thinks it's clever. Actually quite stupid. Roll up! Roll up! Because Bright Club is back for 2013, bringing you another bunch of clever folks to make you smile, and if you’re lucky we’ll even throw in some of the musical stuff for a proper shindig. This time the theme is “Bodies”, so as usual expect wide interpretations and tenuous links. Joanne Ella Parsons, studies men and food in the Victorian novel – um, fat BODIES? PLUS beautiful songstress Nuala Honan who is currently writing a BODIES themed song for your listening pleasure. Tickets will cost £6 on the door. The Bright Club bar will be serving from 6.30pm. 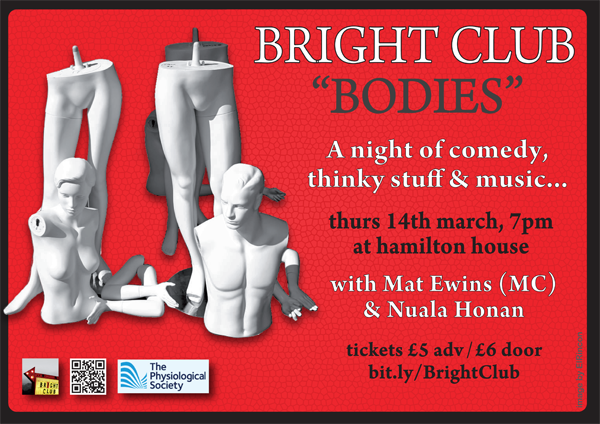 Our bar is on the 3rd floor of Hamilton House – same as the venue for Bright Club. Many thanks to The Physiological Society for supporting Bristol Bright Club #7. This event is also on Facebook. Get an email update when a new post is added. You'll be the first to know about tickets. (No spammy stuff). BCB #1: The First Time – 29th November, SOLD OUT, sa-weeeeet! Cookies? Yum! What cookies? Where? SHOW ME THE COOKIES!